Custom Remote KeyPad, for iPhone/iPad/iPod was originally released for iOS 2 in 2008. After over 25,000 downloads and rave reviews, it was discontinued with the release of iOS 7 for technical reasons. The app has now been entirely rewritten for iOS 8+ using Appleís new Swift language and adopting the latest iOS technologies. Renamed Custom Remote KeyPad, the new release allows the user to design elaborate and beautiful custom control panels and use them to control a Mac wirelessly. Leveraging Appleís new Peer-to-Peer network technology, it uses WiFi and Bluetooth to seamlessly connect an iOS device to the Mac. Custom control panels then send keystroke shortcuts, text, and custom instructions to the Mac. For example, you can dial on the iPad to change brush size in Photoshop; or swipe on an iPhone to rotate a 3D model in Cinema 4D; single taps can issue any menu command in any app, or enter entire paragraphs of text, or run custom Automator scripts. 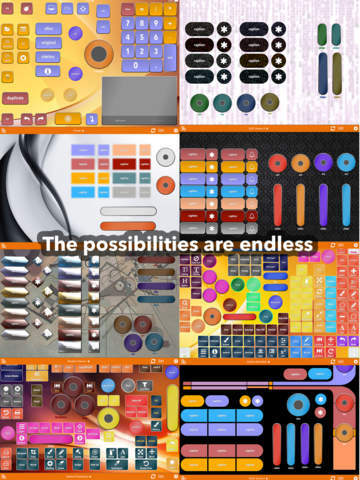 "The possibilities are endless" quoting from a review of the previous version of the app. The new KeyPad app sells for $0.99 and is now available for download for iOS 8+. In addition to designing your own keypads, professionally made control panels can also be bought through the app for $0.99 each, as well as beautiful themes that can be used in your own creations. The app also provides access to the KeyPad Exchange, a community repository of keypads that can be downloaded for free. The developper promises release of many new pro keypads. Keypads for Photoshop and Illustrator are already available, and keypads for Aperture, AutoCAD, Elements, Excel, Final Cut, iMovie, InDesign, iPhoto, Lightroom, Modo, Powerpoint, Premiere, SketchUp, Word, and many more are coming soon. Custom Remote KeyPad aims to become the ultimate remote app on iOS. Currently, Mac OX 10.10+ is supported. Windows and Linux support is planned for the future. Claremont, California - DopplerThePom was founded by Vatche Sahakian in 2008 with the release of iOS 2.0 and has since released 7 apps for iOS, the latests being Custom Remote Keypad and KeyKit. DopplerThePom is based in Claremont, California. All Material and Software (C) Copyright 2008-2015 DopplerThePom. All Rights Reserved. Apple, the Apple logo, iPhone, iPod and iPad are registered trademarks of Apple Inc. in the U.S. and/or other countries. Other trademarks and registered trademarks may be the property of their respective owners.